Russia repeatedly denied using cluster bombs on its missions in Syria. These denials were published by many Russian publications, including Russia’s Ministry of Defense magazine TV Zvezda. 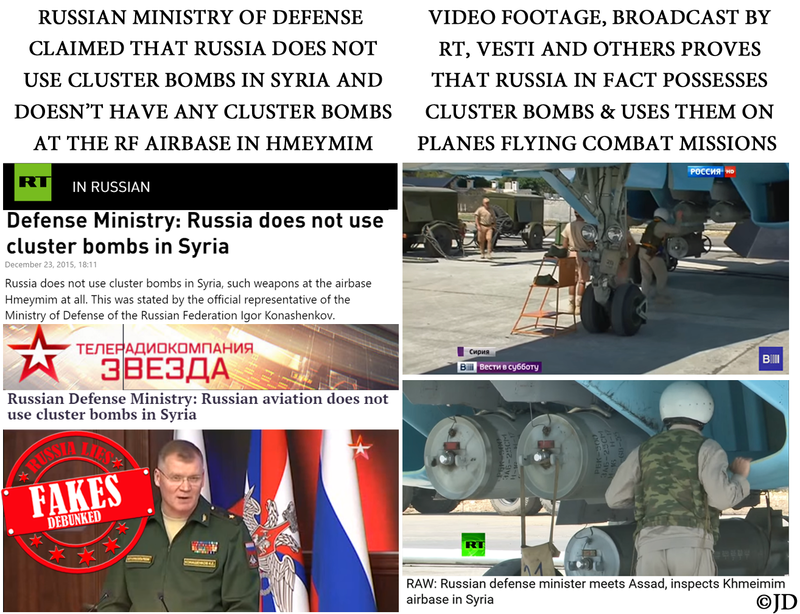 The Russian Defense Ministry spokesman Maj. Gen. Igor Konashenkov exclaimed that Russia not only doesn’t use cluster bombs in Syria, but also doesn’t have any such weapons at its airbase in Hmeymim. RT published these denials. Ironically, it was also RT who inadvertently exposed the fact that the opposite is true. Conflict Intelligence Team spotted cluster bombs in RT’s video, prompting a hasty re-edit, followed by subsequent restoration of the telling film footage. In traditional Russian propaganda style, RT attempted to absolve Russian hooligans of any blame for attacking English fans during Euro 2016 Championship games. 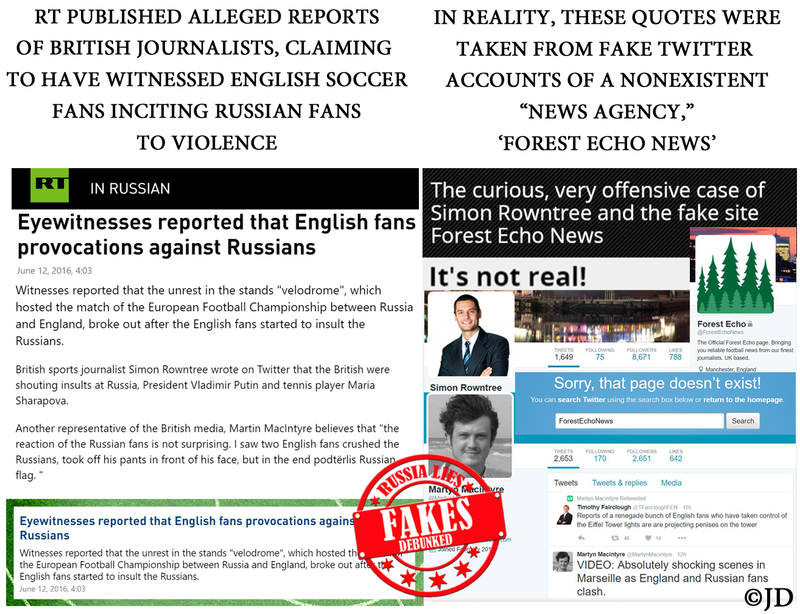 Since there weren’t any real journalists justifying these brutal attacks, RT decided to quote 2 nonexistent journos with the notorious ‘Forest Echo News’ (a fake news org). When the ruse was exposed, RT noted that the information in question was disproven, but never removed the article. Russian Foreign Ministry Spokesperson Maria Zakharova angrily reacted to the comments following the release of Ukrainian pilot Nadezhda Savchenko. “This is one big myth that the Savchenko case and her swap for two Russians either complies with or is in line with or is a natural part of the Minsk agreements,” Zakharova told journalists. In fact, Savchenko’s release is a natural part of the Minsk agreements, which provide for the release of of all hostages and other illegally detained people. Russia’s approach to the fulfillment of the Minsk agreements continues to be flippant and selective at best. 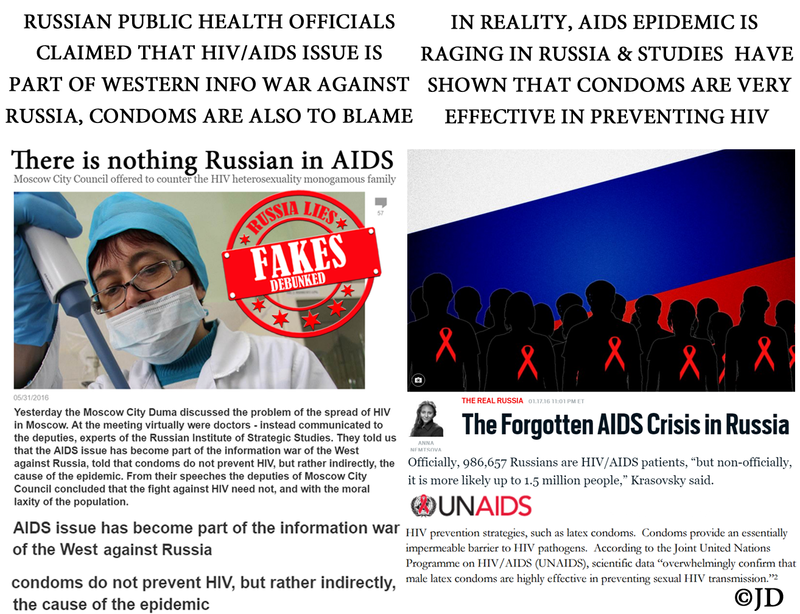 Russian ‘AIDS experts’ claimed that condoms are to blame for the spread of HIV. They’ve also alleged that the HIV epidemic is nothing more than a Western “information war” against Russia. Common sense, medical studies and statistical information easily disprove the theory of condoms as the alleged culprits in the war against HIV. Up to 1.5 million Russians are HIV/AIDS patients and the numbers are rising. The epidemic is real and has absolutely nothing to do with any type of an alleged “information war” by the West. 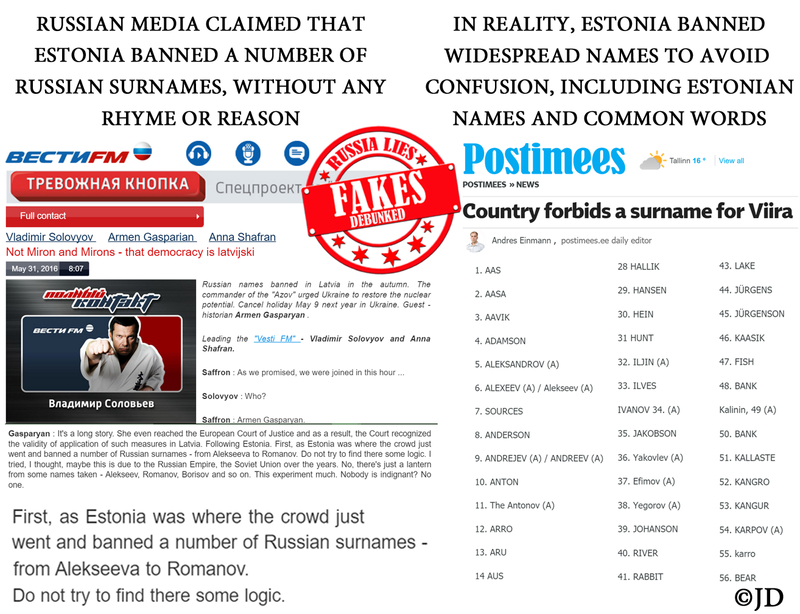 Russian media claimed that Estonia banned a number of Russian names “without any rhyme or reason.” These changes were attributed to “Russophobic de-Russification” of the former USSR republics. In reality, Estonia banned a number of Estonian, Russian and other names, because they were too common and caused confusion. When there isn’t any violence to report in Kyiv, the Russian media feels free to draw from old stories. Sometimes two years old. 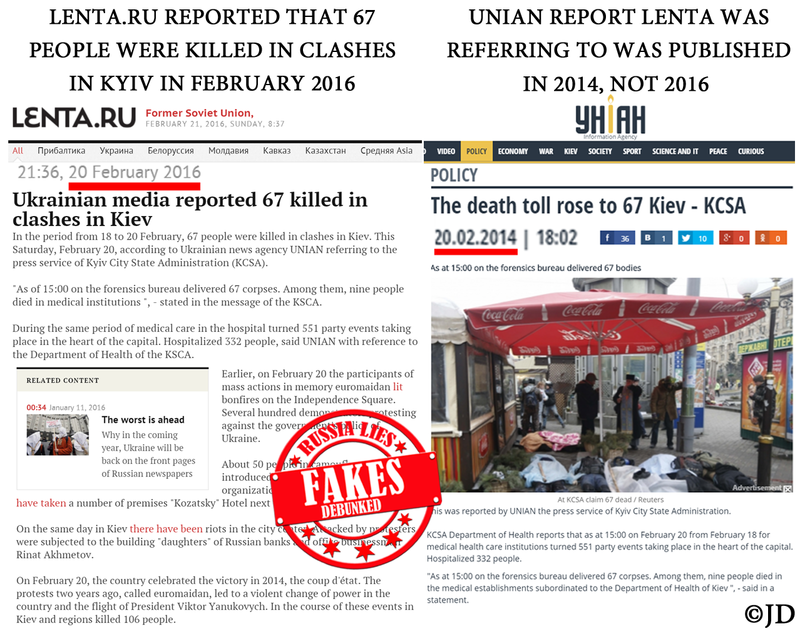 Lenta.Ru traveled back in time to 2014, reporting 67 dead in clashes in Kyiv in February 2016. Lenta later deleted the article. The Unian report, to which Lenta.Ru was referring, was published in 2014 – not 2016. 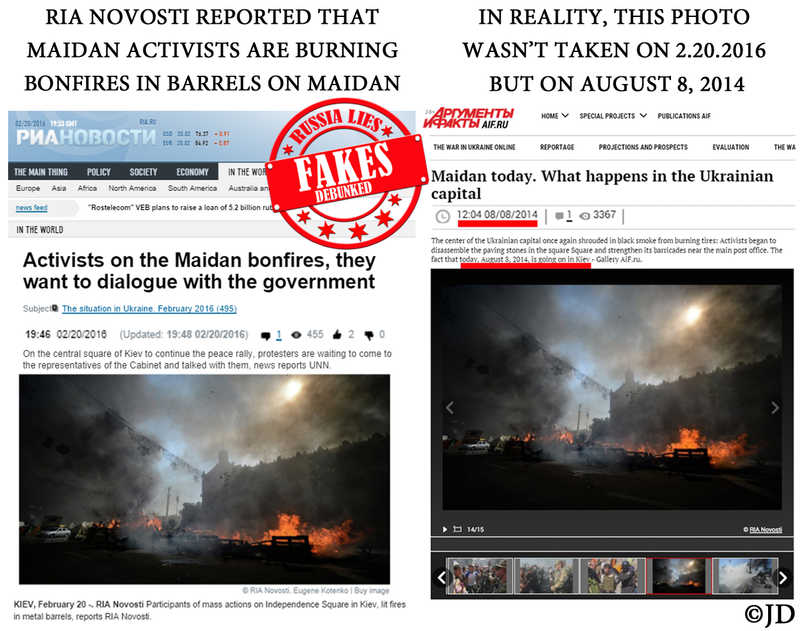 RIA Novosti decided that old stories are as good as new and published an image of bonfires on Maidan. 2016 or 2014 – what’s the difference? Anything that makes Ukraine look like a failed state with constant unrest works for Russian propaganda. Russia’s president Vladimir Putin likes to fashion himself as the biggest defender of exotic animals. Nothing could be further from the truth. 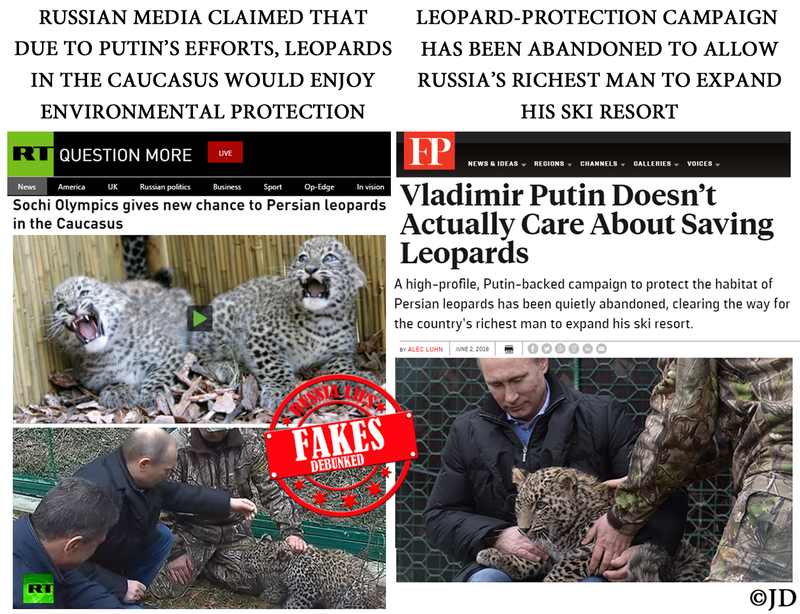 A tiger died because of Putin’s PR stunt. Leopards, who were supposed to be protected under Putin’s Sochi program, are being placed in peril, instead. The Putin-backed campaign to protect the habitat of Persian leopards has been quietly abandoned, clearing the way for the country’s richest man to expand his ski resort. Exotic animals are merely pawns in Putin’s game of power, money and PR. Russian media exclaimed that in the near future, Ukrainians may be forced to change Russian names and surnames to Ukrainian ones. 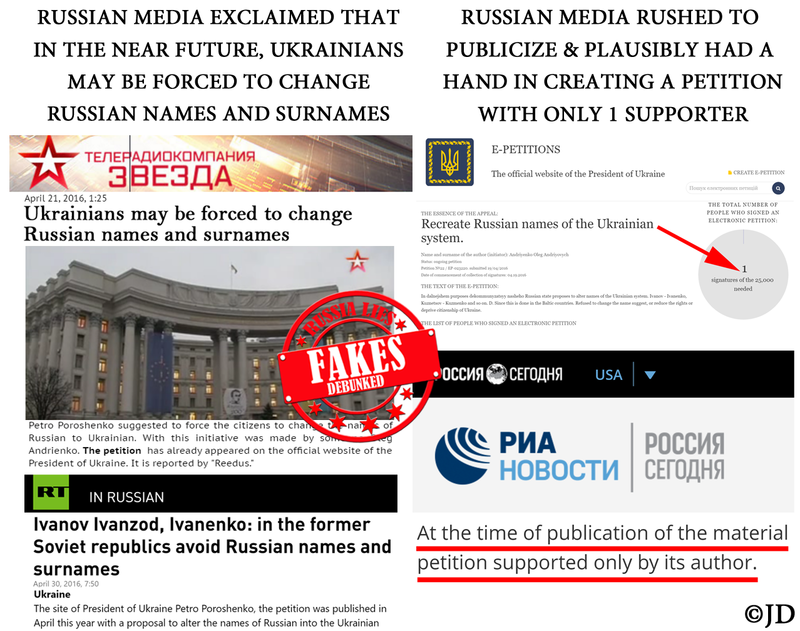 This fabrication was based on a petition that was supported only by its author at the time the Russian media rushed to publish these stories. To date, the petition in question gathered only 10 signatures and was clearly unworthy of being publicized, if not for its propaganda value. 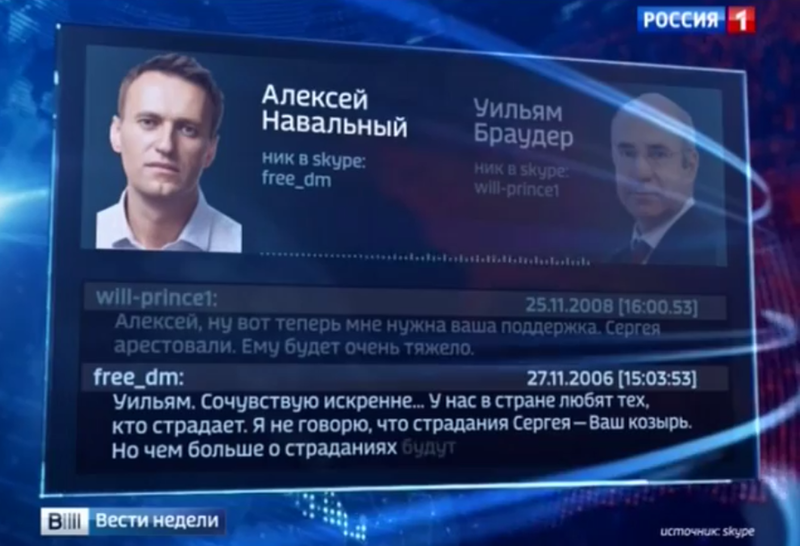 In a clearly fabricated story, Russia’s state-sponsored Vesti claimed that in 2006 Russian opposition leader Alexei Navalny replied to Bill Browder’s message from 2008. The video was later removed, re-edited and uploaded yet again. Russian state-controlled media continues its unrelenting quest to discredit multiple enemies of Vladimir Putin at once. Hence, Vesti attempted to connect Alexei Navalny, Bill Browder, his deceased lawyer Sergei Magnitsky and the CIA in this ludicrous fake story. Russia’s state-sponsored Vesti attempted to prove the links between Russian opposition leader Alexei Navalny, investment banker/human rights activist Bill Browder, his deceased lawyer Sergei Magnitsky and the CIA. To support these ridiculous connotations, the program demonstrated an obviously fake “CIA memorandum” signed by none other than Valerie Plame. Clumsy fake-makers didn’t bother to check that Valerie Plame resigned from the CIA on Jan 9, 2006 (fraudulent memo was supposedly written in 2009). 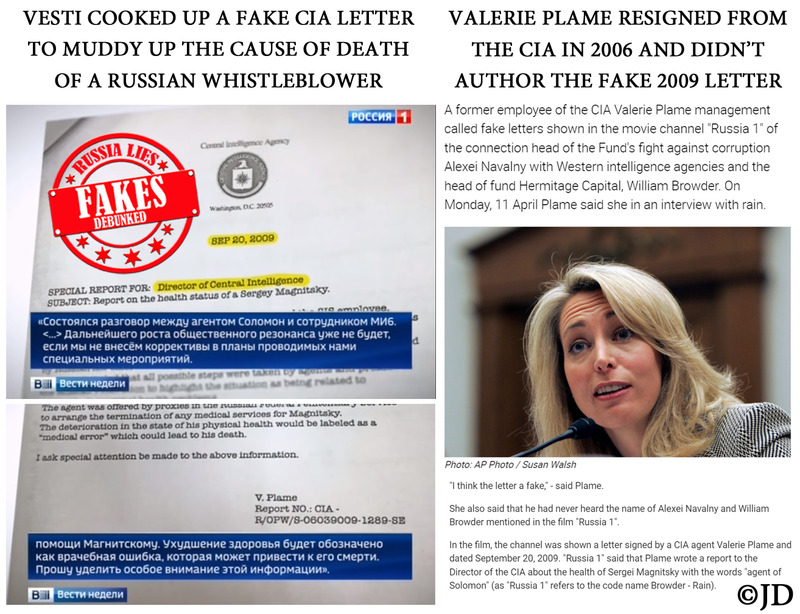 Valerie Plame was interviewed and described the letter as an obvious fake. 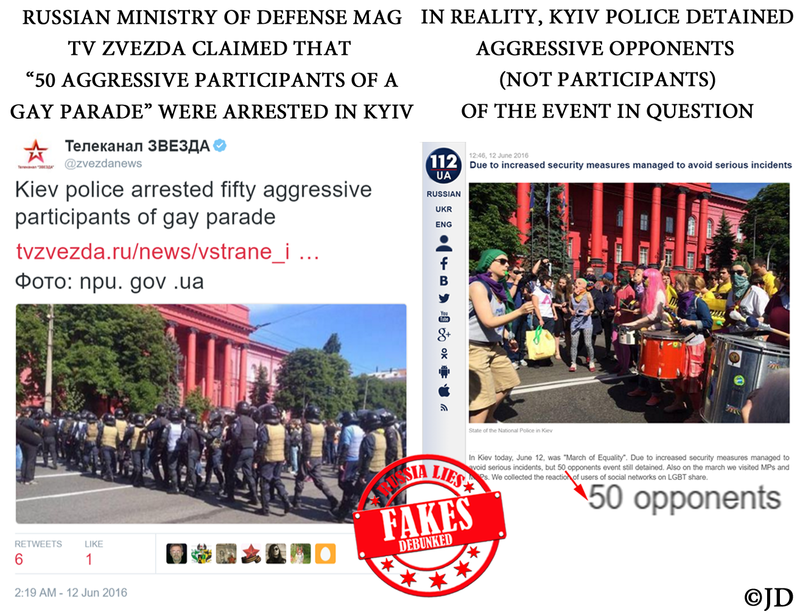 Openly homophobic Russian media claimed that 50 “aggressive participants” were arrested during March of Equality in Kyiv, Ukraine. In reality, multiple opponents (not participants) of the parade were detained. State-sponsored Vesti and its host, Dmitry Kiselyov, the head of Rossiya Segodnya (Russia Today), demonstrated a purportedly original document belonging to a Ukrainian who allegedly fought on the side of Hitler. 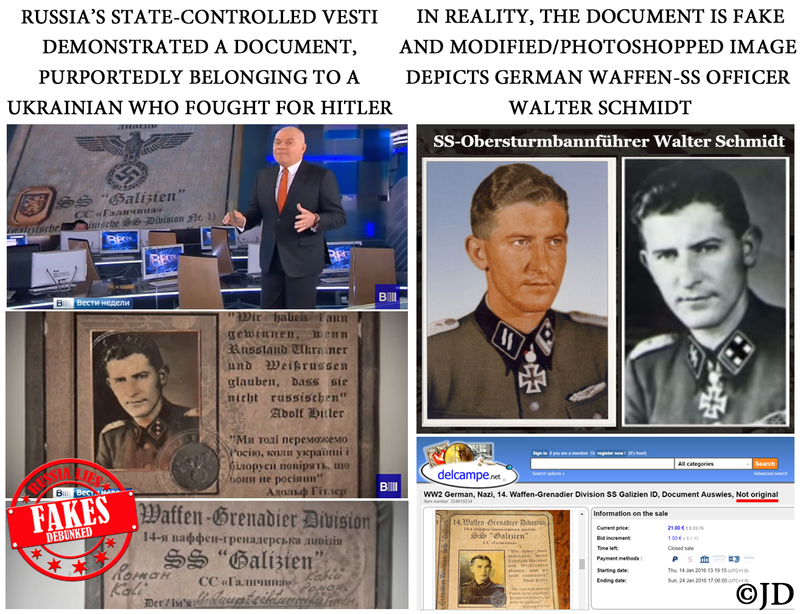 The document was a fake, with computer-generated text and the photo of a German Waffen-SS Officer Walter Schmidt. Kiselyov later admitted that the document was a fake, blamed amateurs for making a cheap novelty item and never apologized for using it during the broadcast. 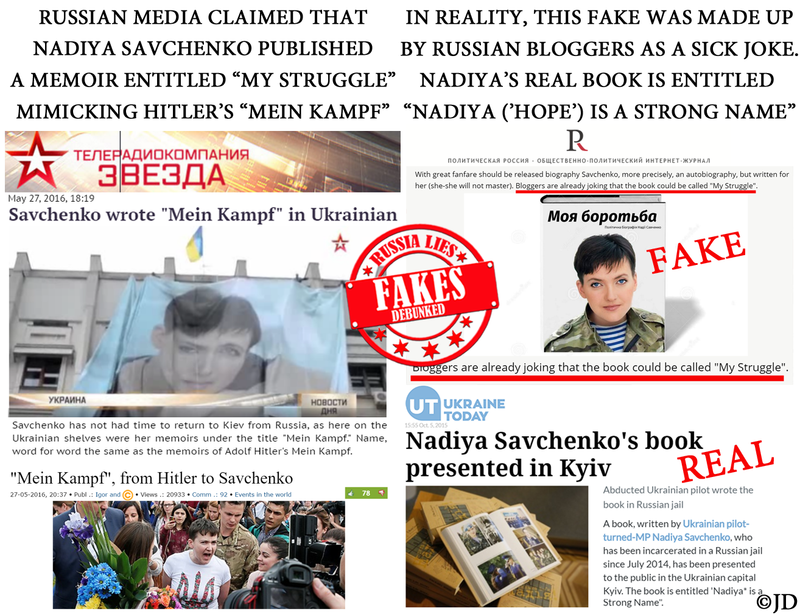 Russian Ministry of Defense’ publication TV Zvezda and others claimed that Ukrainian pilot Nadiya Savchenko authored a memoir, entitled “Mein Kampf” in Ukrainian. Russia claimed to be closely following and complying with all the rules of the Convention on “inhumane” weapons. 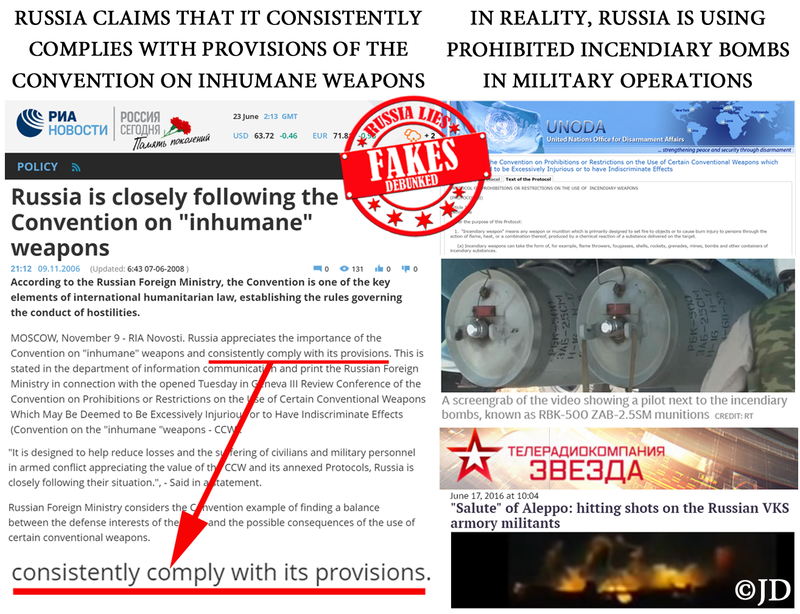 In reality, Russia is using incendiary weapons, specifically prohibited by the Protocol III, Article 1 of the Convention. 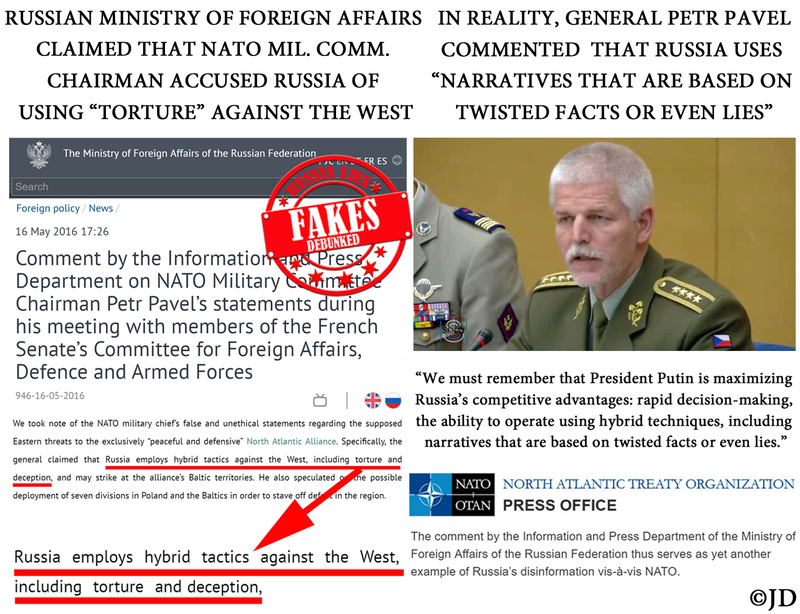 Even after NATO complained that Russia’s Ministry of Foreign Affairs willfully misrepresented the content of General Pavel’s statement, Russian MFA failed to amend its commentary – inadvertently exemplifying Russia’s use of twisted facts and/or lies for propaganda purposes. 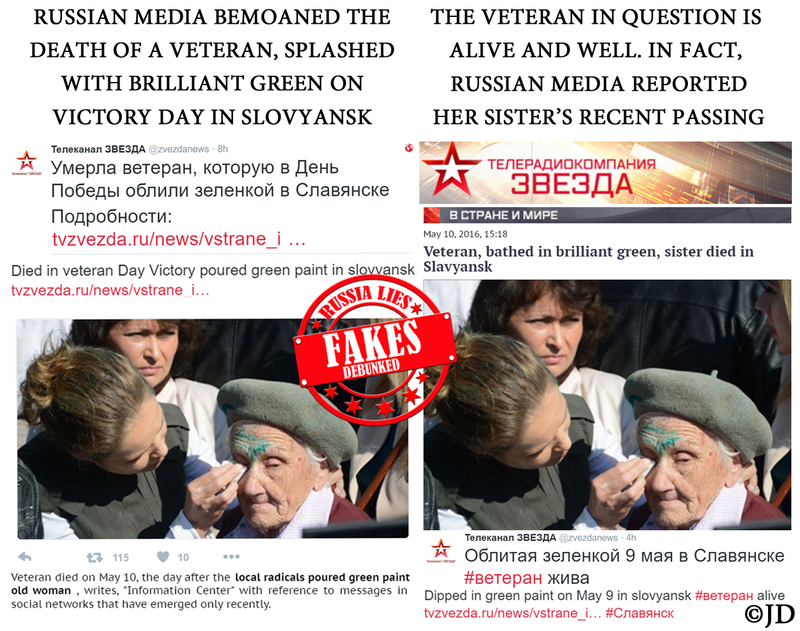 In an example of a multilayered lie, the Russian media bemoaned the death of an elderly female WWII veteran, who was said to die the next day after being splashed with “brilliant green” by Ukrainian radicals in Slovyansk, Ukraine. First of all, close examination of available video footage reveals that the lady wasn’t splashed with anything by the radicals. A group of women painted themselves (and the veteran in question) with “brilliant green” in solidarity with the female politician who was indeed splashed that day. Photos were later used for a cynical photo-op. Furthermore, contrary to the articles published by TV Zvezda, ITAR-Tass, Komsomolskaya Pravda, Vzglyad, state-controlled Vesti and others, the granny in question didn’t die. Even after TV Zvezda refuted its own report, finally admitting that the veteran is alive and well, none of the other publications retracted, removed or amended their intentionally deceptive articles. This kind of disregard for the truth is at the core of Russian propaganda. 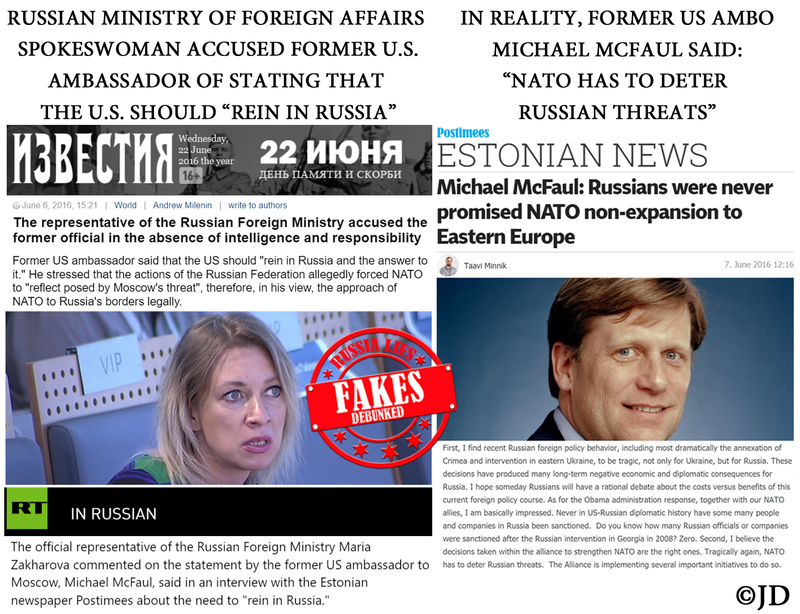 Russian Foreign Ministry Spokesperson Maria Zakharova accused former U.S. Ambassador Michael McFaul of “absence of intellect and responsibility,” upset by his alleged statement that the U.S. should rein in/bridle Russia. As usual, Russia was offended by an entirely invented quote. 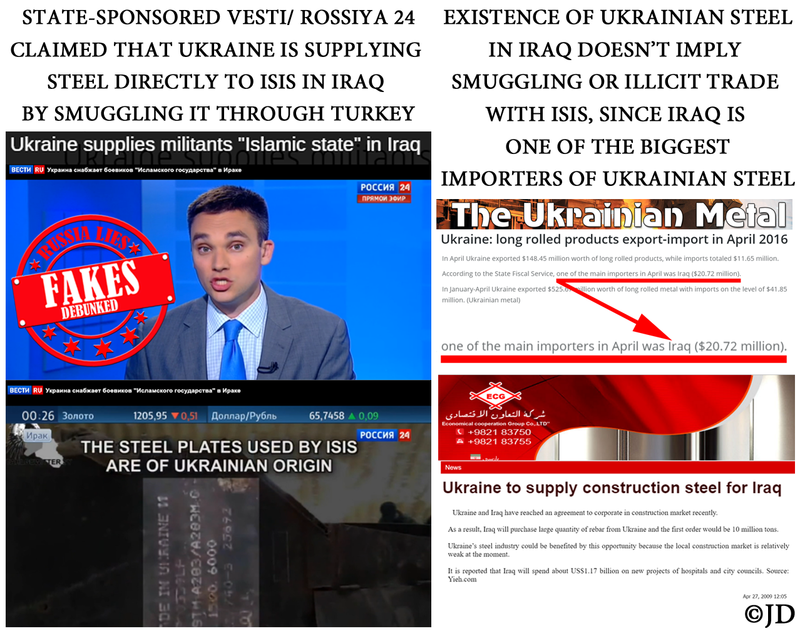 Vesti claims Ukraine is supplying steel directly to ISIS through illicit trade/ smuggling via Turkey. The host is outraged, crying out: “How, but how did ISIS in Iraq get a hold of Ukrainian steel?” That is hardly a mystery, considering that Iraq is one of the biggest steel importers from Ukraine. The implication of direct links between Ukraine and ISIS rings hollow, in spite of Russia’s multiple desperate attempts of connecting the two. Russia’s lie factory doesn’t have any off-limit topics. Russian media claimed that Russia’s FSB warned Belgian authorities prior to the Brussels attacks, naming Alexei and Ivan Dovbash as the ISIS terrorists preparing to commit the terrorist acts. 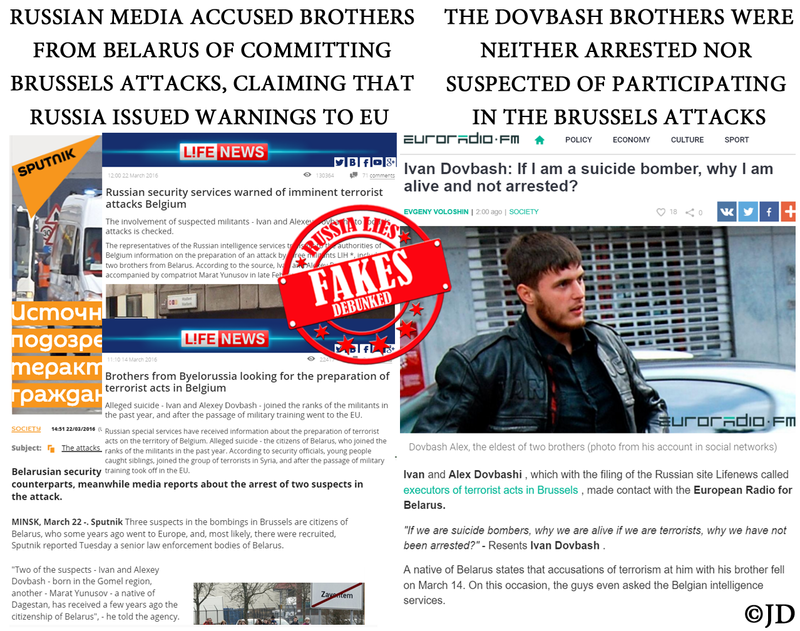 After the attacks, Russian publications claimed that the brothers are on the run and Belgian authorities are actively searching for them. “One of them has a beard, that’s for sure!” – reported Sputnik. The part about the beard was the only nugget of truth in this twisted story. Brothers Dovbash were not in Brussels at the time of the attacks and had nothing to do with their planning. Belgian authorities neither suspected, nor searched for them – contrary to the baseless assertions publicized by the Russian media. So why tell such a lie? The answer is quite simple: to keep Russia relevant. To make it seem important as a “partner in the war in terror,” because one doesn’t sanction or shun its partners.